If you'd like to make your presentations more dynamic and exciting, try using Zoom for PowerPoint. To add a Zoom, go to Insert > Zoom. When you create a Zoom in PowerPoint, you can jump to and from specific slides, sections, and portions of your presentation in an order you decide while you're presenting. Zoom for PowerPoint is only available on Windows—in Office 365 and PowerPoint 2019. A Summary Zoom is like a landing page where you can see the pieces of your presentation all at once. When you're presenting, you can use the Zoom to go from one place in your presentation to another in any order you like. You can get creative, skip ahead, or revisit pieces of your slide show without interrupting the flow of your presentation. Summary Zoom is now supported for Office 365 subscribers in PowerPoint for Office 365 for Mac beginning with version 16.19.18110915. Go to Insert > Zoom. The Summary Zoom dialog box opens. Select slides you want to include in your Summary Zoom. These become the first slides of your Summary Zoom sections. 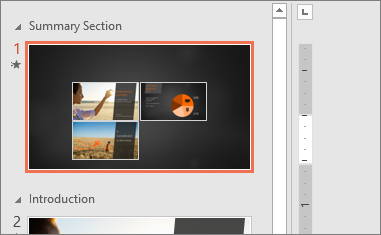 To learn more about using sections in PowerPoint, see Organize your PowerPoint slides into sections. If you already have sections in your presentation, the first slide of each section is preselected by default. If you don't want to include certain sections in your Zoom, deselect them. Then, if you want PowerPoint to get rid of any sections you didn't include in your Summary Zoom, clear the check box next to Keep unused sections in your presentation. Don't worry—the slides in the sections you're discarding will still be part of your presentation. 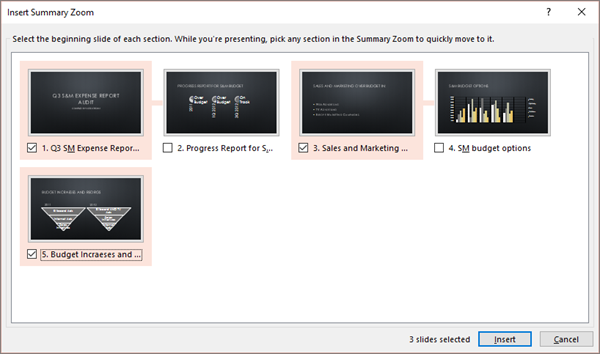 Once you've selected all the slides you want to use for your Summary Zoom, select Insert. Your Summary Zoom is created, and it appears as a new slide just before the first slide you included in your Summary Zoom. Once you've created a Summary Zoom, you might still want to add or remove sections of your presentation. If you've made changes since first making your Summary Zoom that you want to capture, you don't have to start from scratch—just update your Summary Zoom. Select your Zoom, and then select the Format tab on the ribbon. Select Edit Summary, choose the sections you want to have in your Summary Zoom, and then select Update. Note: You won't be able to add or remove sections from your presentation in this view, just from your Summary Zoom. A Slide Zoom can help you make your presentation more dynamic, allowing you to navigate freely between slides in any order you choose without interrupting the flow of your presentation. They're a good option for shorter presentations without lots of sections, but you can use Slide Zooms for lots of different presentation scenarios. Slide Zooms help you drill down into multiple pieces of information while feeling as though you're staying on the same canvas. The Slide Zoom dialog box opens. Select the slides you want to use in your Slide Zoom. Once you've selected all the slides you want to use, select Insert. Your Slide Zoom is created. Tip: If you want to, you can create a Slide Zoom quickly by simply selecting the slide you want from the thumbnail pane and dragging it onto the slide you'd like to have your Slide Zoom on. This way, you can create Slide Zooms and change them quickly, and arrange them however you like simply by clicking and dragging. Your Slide Zoom by default will be a preview thumbnail image of the slide, but you can choose a new image from your PC or the web to represent the section or slide you'll be going to. Select Change Image to choose a new picture from the web or your PC to use instead of the thumbnail. Choose or search the web for the image you want. When you've selected the image you want, select Insert. You can also choose various looks for your Zooms from Zoom Styles—you can change the border, add visual effects, or pick from any of the border and effect combinations in the gallery. 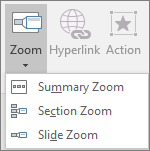 A Section Zoom is a link to a section already in your presentation. You can use them to go back to sections you want to really emphasize, or to highlight how certain pieces of your presentation connect. 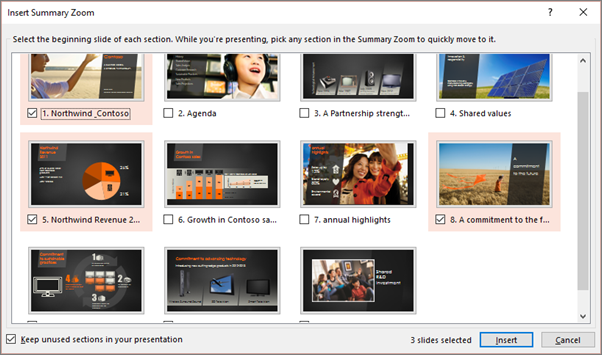 To learn more about using sections in PowerPoint, see Organize your PowerPoint slides into sections. Select the section you want to use as a Section Zoom. Select Insert. Your Section Zoom will be created. Tip: If you want to, you can create a Section Zoom quickly by simply selecting the section name you want in the thumbnail pane and dragging it onto the slide you'd like to have a Section Zoom on. Your Section Zoom by default will be a preview thumbnail image of the slide, but you can choose a new image from your PC or the web to represent the section or slide you'll be going to. Zoom for PowerPoint truly lights up when you make it your own. Select the Format tab of the ribbon to get to the Zoom Tools, which you can choose to create just the look and feel you're going for when you present. If you want to return to the Zoom slide after viewing sections or slides in your Summary, Slide, or Section Zoom, make sure the Return to Zoom check box is selected. If you want to move on to the next slide after viewing part of your Zoom, uncheck it. Another way you can change the look of your Zoom is by choosing to adopt the background of the slide where your zoom lives to make the Zoom almost indistinguishable from the main canvas while you present. Select Zoom Background to make your Summary, Section, or Slide Zooms blend in to their home slide. In the Zoom Styles group, select Zoom Background. The Zoom will adopt the background of the home slide. By default, your Zooms will use the Zoom Transition when you present, which is what helps make the Zooms feel so lively. However, if you don't want to use the Zoom Transition, or if you want to change the duration of the transition, you can do so. In the Zoom Options group, make sure the box next to Zoom Transition is checked if you want to use the Zoom Transition when presenting your Zoom. If you don't want to use the Zoom Transition when presenting, uncheck the box next to Zoom Transition. To change the timing of the Zoom Transition, use the up and down arrows next to the Duration indicator to change how long the Zoom Transition lasts. See the following table for details on the minimum version numbers required in PowerPoint to create or play Zoom links. Back to Zoom navigation isn't supported.